Is It OK to Take a Teaspoon of Extra Virgin Olive Oil for Overall Health? Olive oil is an integral part of the oft-touted Mediterranean diet, a diet based on consumption of fresh vegetables and fruits, fish and unsaturated oils. Although a fat, olive oil has a number of components that appear to lower the risk of heart disease. The term extra-virgin describes high-quality olive oil with the best flavor and maximum nutrition. Adding a teaspoon of olive oil to your daily diet is an excellent idea, especially if you use it to replace fats that aren't as healthy. A teaspoon of olive oil has 40 calories; all the calories are from fats. One teaspoon has 4.5 grams of fat. Most of the fat, 3.3 grams, is an omega-9 monounsaturated fat, oleic acid. Olive oil has no cholesterol. Vitamins found in olive oil include fat-soluble vitamins E and vitamin K. One teaspoon also has a very small amount of iron. Olive oil contains phytosterols, plant compounds with weak estrogenic effects that may reduce cholesterol absorption and flavenoids that act as anti-oxidants, called polyphenols. Polyphenols have anti-oxidant properties that may reduce the risk of heart disease. Anti-oxidants scavenge free radicals, unpaired molecules that cause oxidative stress in cells. Oxidation leads to destruction of cell DNA. Cellular damage can lead to cancer, heart disease, elevated cholesterol and other disease processes. Unsaturated fats have been shown to lower blood pressure, reduce low-density lipoprotein, the "bad" cholesterol, raise high-density lipoprotein, the "good" cholesterol, and lower triglycerides, all of which can decrease your risk of heart disease. Olive oil may also help control blood sugar, reducing the risk of diabetes. Vitamin E in olive oil, along with anti-oxidants, may also reduce atherosclerosis, the plaque buildup in arteries caused by high cholesterol. Healthy fats make up about 40 percent of the Mediterranean diet. The benefits of the diet may come from other nutrients in the fish, nuts, vegetables and fruits all working together. Replacing less-healthy oils like margarine and butter with olive oil instead of just adding a teaspoon of olive oil to your diet will have more health benefits. Aim for 10 to 25 percent of your daily calories from monounsaturated fats, the Harvard School of Public Health suggests. 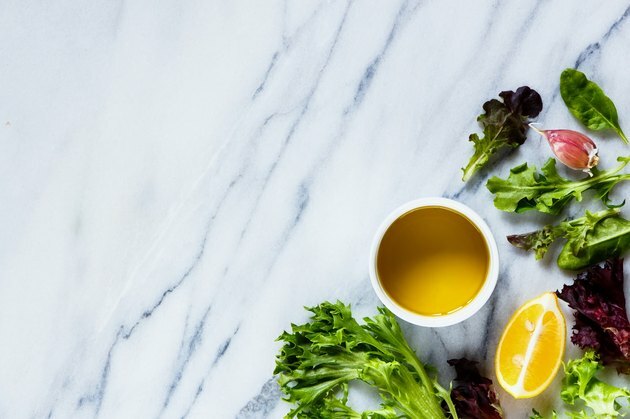 Just adding a teaspoon of extra-virgin olive oil to your diet if you don't eat the right foods otherwise is unlikely to help your overall health. Just adding olive oil to unhealthy foods doesn't make them healthy. Because olive oil is a fat, eating too much can increase your calorie intake and cause weight gain, although the 40 calories in one teaspoon aren't likely to cause weight gain all by themselves. What Can Pregnant Women Eat and Drink?